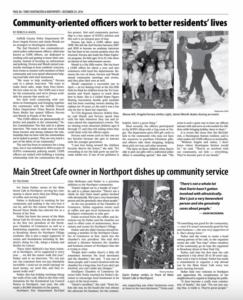 The Times of Huntington-Northport published this piece in print on Dec. 29, 2016. Suffolk County Police Department Officers Angela Ferrara and Jamie Wendt are no strangers to Huntington residents. The 2nd Precinct’s two community-oriented police enforcement officers, otherwise known as COPE officers, are dedicated to working with and getting to know their community. 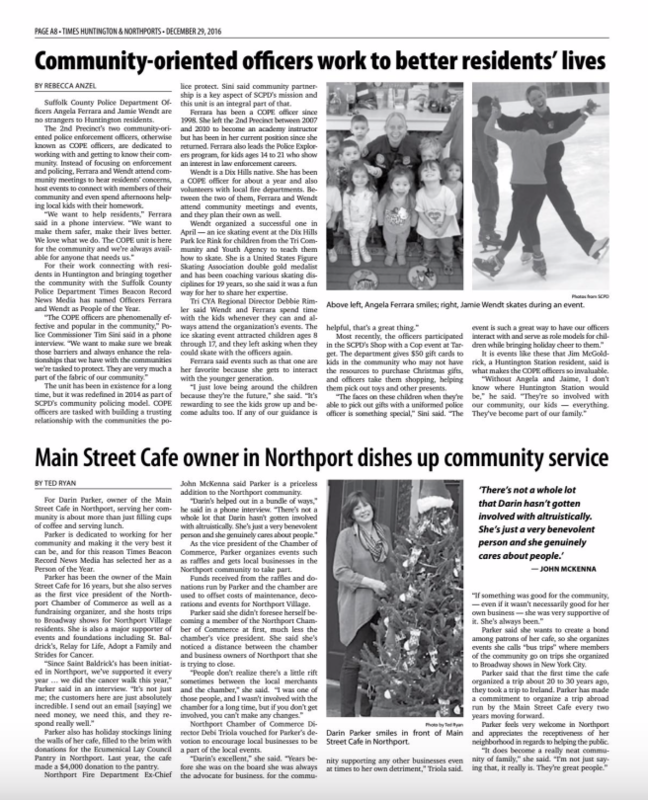 Instead of focusing on enforcement and policing, Ferrara and Wendt attend community meetings to hear residents’ concerns, host events to connect with members of their community and even spend afternoons helping local kids with their homework. For their work connecting with residents in Huntington and bringing together the community with the Suffolk County Police Department, Times Beacon Record News Media has named Officers Ferrara and Wendt as People of the Year. The unit is not new, but its goals were redefined in 2014 as part of SCPD’s community policing model. COPE officers are tasked with building a trusting relationship with the communities the police protect. Sini said community partnership is a key aspect of SCPD’s mission and this unit is an integral part of that. Ferrara has been a COPE officer since 1998. She left the 2nd Precinct between 2007 and 2010 to become an academy instructor but has been in her current position since she returned. Ferrara also leads the Police Explorers program, for kids ages 14 to 21 who show an interest in law enforcement careers. 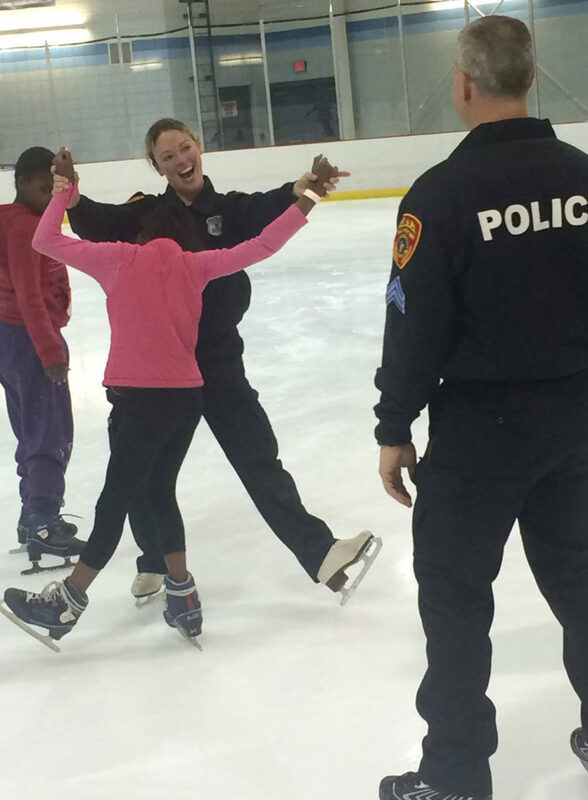 COPE Officer Jamie Wendt skates during an event. Photo from SCPD. Wendt is a Dix Hills native. She has been a COPE officer for about a year and also volunteers with local fire departments. Between the two of them, Ferrara and Wendt attend community meetings and events, and they plan their own as well. Wendt organized a successful one in April — an ice skating event at the Dix Hills Park Ice Rink for children from the Tri Community and Youth Agency to teach them how to skate. She is a United States Figure Skating Association double gold medalist and has been coaching various skating disciplines for 19 years, so she said it was a fun way for her to share her expertise. Tri CYA Regional Director Debbie Rimler said Wendt and Ferrara spend time with the kids whenever they can and always attend the organization’s events. The ice skating event attracted children ages 8 through 17, and they left asking when they could skate with the officers again. Ferrara said events such as that one are her favorite because she gets to interact with the younger generation. Most recently, the officers participated in the SCPD’s Shop with a Cop event at Target. The department gives $50 gift cards to kids in the community who may not have the resources to purchase Christmas gifts, and officers take them shopping, helping them pick out toys and other presents. It is events like these that Jim McGoldrick, a Huntington Station resident, said is what makes the COPE officers so invaluable. 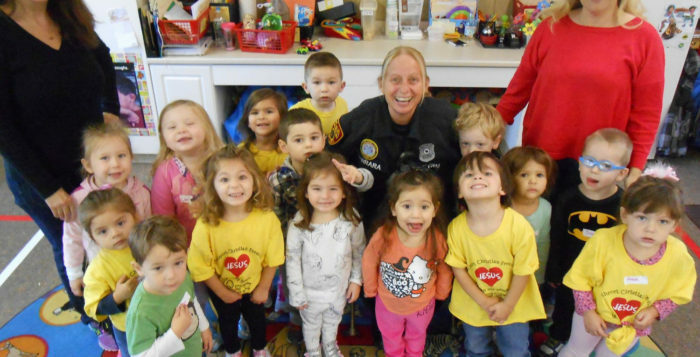 COPE Officer Angela Ferrara smiles with students in Huntington. Photo from SCPD.